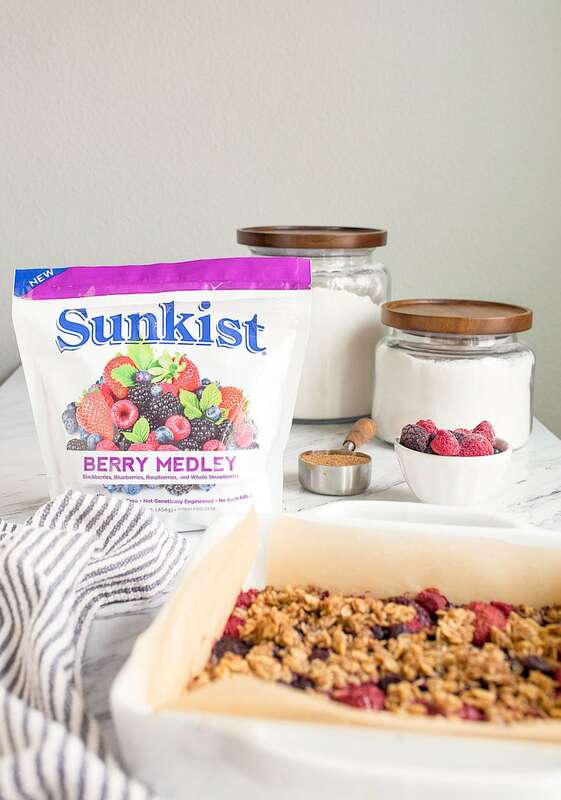 Mixed berry baked oatmeal recipe. This post is sponsored by the National Frozen and Refrigerated Foods Association, also known as NFRA. See EasyHomeMeals.com for more recipes & tips. But now? Camille will not touch oatmeal. I have to put sprinkles on it to get her to eat 3 bites. I’m overjoyed about those 3 bites, though. I’m such a believer in healthy whole grains, and I know how great oats are for you. If she just eats 3 bites of oats once a month, I’m happy. But, I’ve been trying to dream up ways to include oatmeal in her breakfast in a more exciting way. 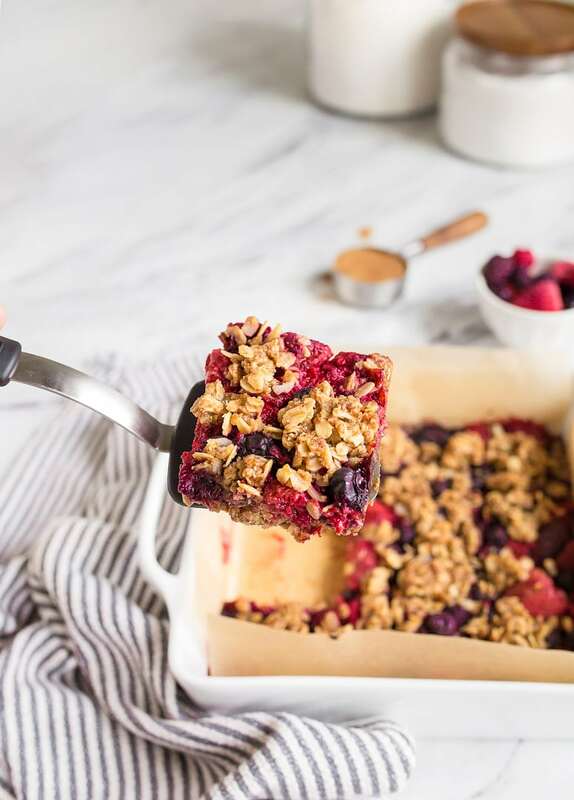 Enter these mixed berry baked oatmeal bars. They’re pretty (Camille loves colorful food), delicious, and full of oats. I use rolled oats and oat flour (which is just oats that I ground up in the blender, by the way. No need for a second purchase!) So, bonus for being gluten-free, right? Camille devoured these, and I smiled about it all morning. She thinks she had cake for breakfast, but I know the truth. 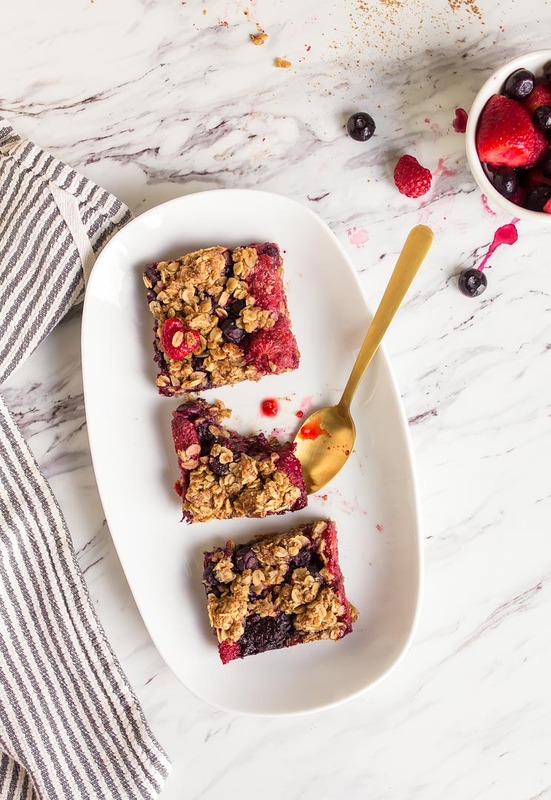 She had antioxidant-rich mixed berries, fiber-ful oats, and grass-fed butter. There is no better breakfast, if you ask me. Speaking of the butter, it’s easily swapped for coconut oil to keep things vegan, ok? 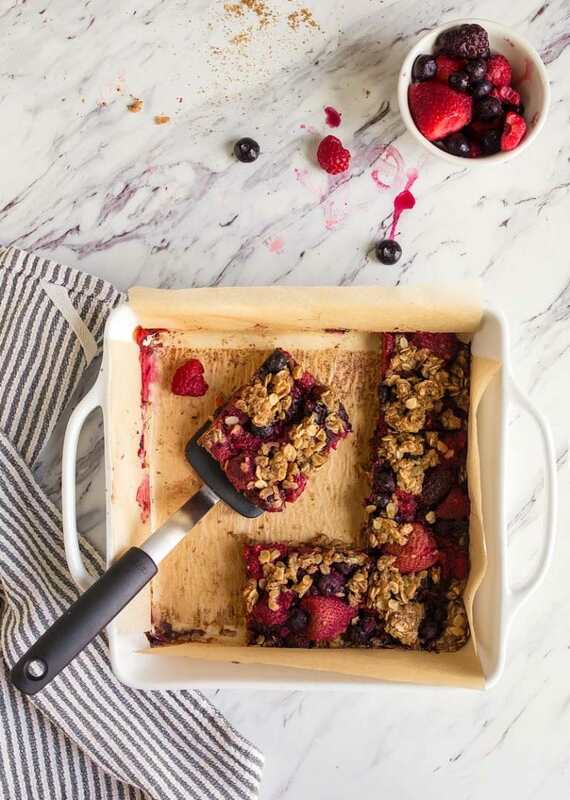 These bars pack a punch with a full pound of frozen mixed berries. 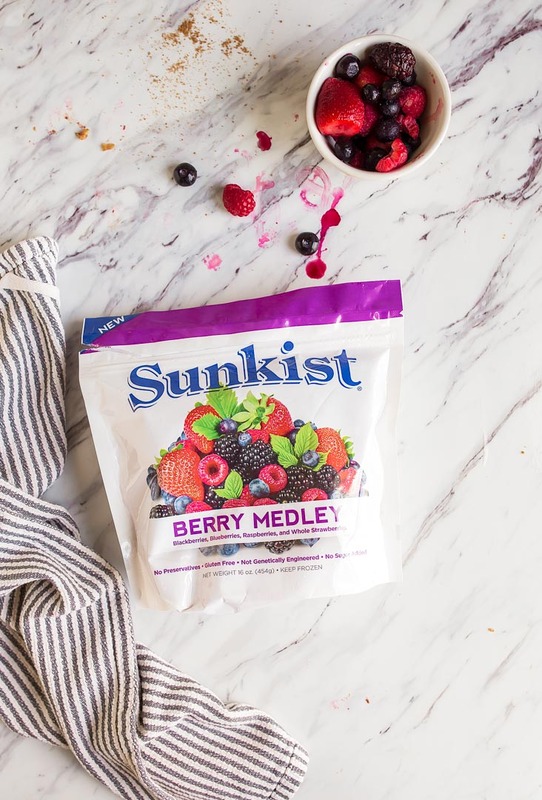 I use an entire bag of the new Sunkist brand of mixed berries, and I swear I’m not just saying this because this is a sponsored post, but these are seriously the highest-quality frozen berries I’ve ever bought! I even emailed the PR rep to say how impressed I am, because when I defrosted the berries on the counter, they held their shape! I’m so appreciative of the high convenience factor here—a healthy breakfast for Camille using berries that I can always keep in the freezer. 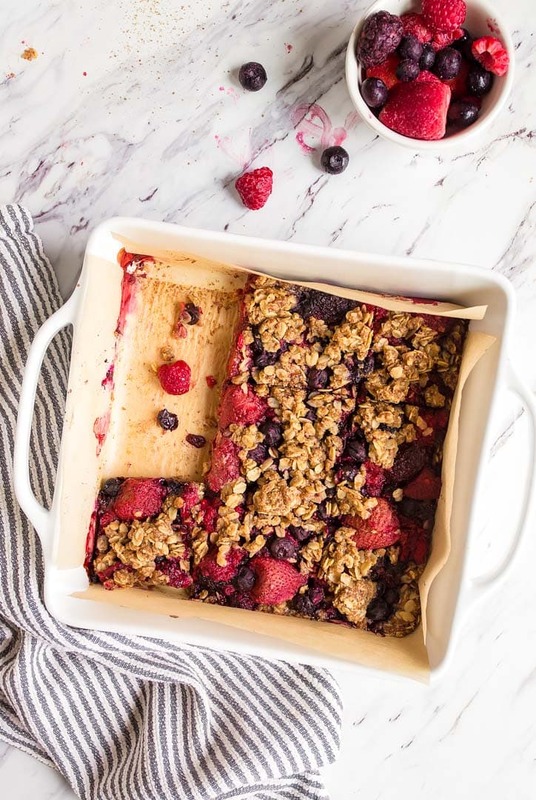 Plus, these mixed berry baked oatmeal bars cut easily into squares and hold their shape in a lunch box. You’re looking at my new favorite recipe that’s going on the weekly meal plan list! Mixed berry oatmeal bars are a fun way to get your kids to eat more oats! Partially defrost the berries at room temperature in a large bowl for about an hour. Meanwhile, make the oat flour if you haven’t already. Preheat the oven to 375. Line an 8x8" square pan with parchment paper in two directions, so all sides are covered. Leave excess parchment paper so you have handles for removing the bars. In a medium bowl, stir together the oats, oat flour, coconut sugar, cinnamon and salt. Set aside. Melt the butter in the microwave in a small dish. Pour the butter into the oat mixture and stir until everything is evenly mixed. Remove a heaping 1/2 cup of the oat mixture and reserve it for the top. Press the oat mixture into the prepared pan. Press it firmly and evenly to make the crust. Next, drain the juice from the berries (but don't toss it--either drink it straight or stir it into some sparkling water or a smoothie). Gently stir the cornstarch, lemon zest and lemon juice into the berries. Pour the berry mixture evenly over the crust. Sprinkle the reserved 1/2 cup of oat mixture on top of the berries. Bake for 30-35 minutes, or until the bars are bubbling and the top is golden brown. Let cool completely before slicing into squares and serving. I ruined my now-14 month old on oatmeal too. ???? Have you tried freezing the individual servings after you bake them? I’ve taken to stocking my freezer with waffles, oatmeal breakfast cookies, and individual egg casseroles to pack her for breakfast and I’d love to add these to my rotation. Thank you! HI! Could coconut oil be used in place of butter? I need to make these real soon! I’m allergic to coconut :( can I use regular sugar or something else in place of it? My 7 year old kid was not much into oatmeal either. Actually, here in Spain it was not even known till recently so I’ve had a hard time fiding good brands. Some time ago we went to one of those organic food fair and she got a sample of an organic chocolate warm oatmeal, and she actually loved it! This is the way she likes eating oatmeal now, warm, cooked in milk for creamier texture and with some chocolate in it. I also add nuts to it, which she happens to love as well. I get really good quality cocoa with no added sugar or weird stuff so even if her oatmeak is chocolate flavoured she is have a big ammount of nutrients and I love that! Another way she gets to eat oeatmeal without her knowing is on smoothies and muffins. I use oats to make oat flour all the time, which I use for baking cookies, muffins or breads. These bars look divine by the way!! I love berries soooo much! This looks good? Could I substitute the same amount of sucanat or brown sugar instead of coconut sugar? Less healthy but that’s what I have on hand. I like oats and berries and this indeed is a healthy treat for any age. Loved that there’s a mix of cinnamon for added flavor. Perfect for any day snacking! These look delicious! I want to make these! Such a great alternative to a healthy breakfast! I saved my “juice shot” in the fridge and added a teaspoon or two of it to plain yogurt (plus a pinch of sprinkles for fun) to make “pink yogurt” for my 2 year old! How would you describe the texture? 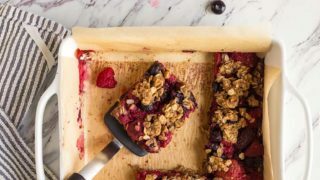 Is it similar to the packaged granola bars you’d get in a grocery store or less chewy? Do left over bars get stored in the fridge? It’s 1405 divided by the number of bars you cut into. I think you can get 9 bars from that. Check the info again. This sounds and looks amazing…please tell me the nutritional information is wrong? The calories are for the whole pan.